← Using Sheep Wool in the Garden! Needle felting faces is my favorite part of the felting process; it really brings the felted project to life. This tutorial focuses primarily on needle felting basic yet animated faces. 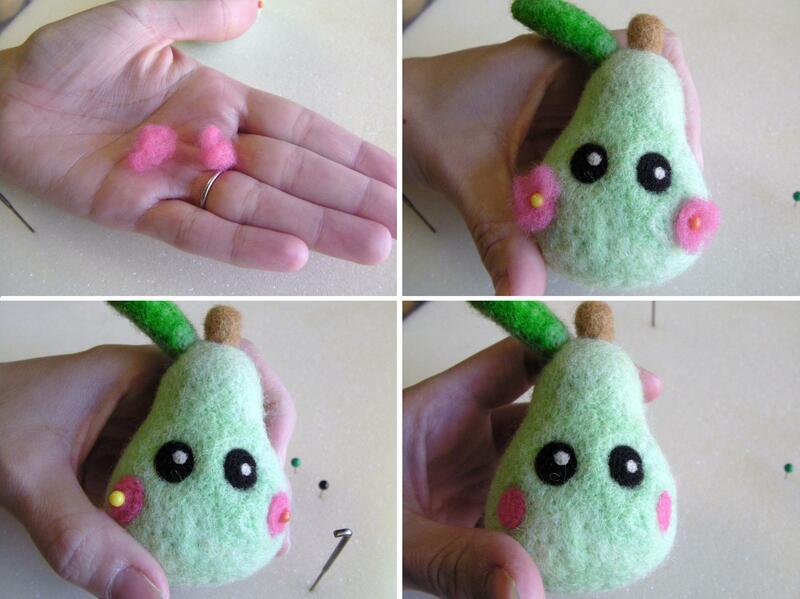 The adorable pear below will be used to demonstrate this process! Before I add a face of any kind, I basically have completed the entire felted project minus the all important face. 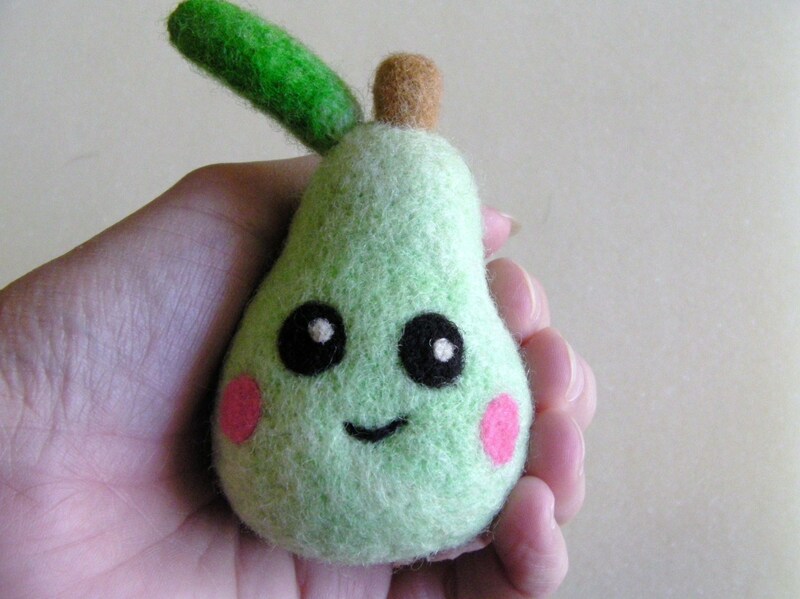 As you can see this pear is already shaped and colored; you cannot necessarily see this, but the pear is also densely felted before I add the face. Adding a face on a soft felted project will result in the eyes, nose, or mouth being indented. This indentation could misshapen your final product! After the colors and shapes of the product are as desired, it is time to add that face! Sometimes, before I add a face I think my felted project is not going so well. After all, a face really animates the overall feltie. But waiting til the end, really is the best. So here we go. Place straight pins where you would like the eyes, cheeks, nose, or mouth to go. If you have made a sketch of your desired product, refer to it at this point. If not, simply rearrange the straight pins until the positions of the major facial features seems correct. I have placed a needle for the eyes and cheeks. The mouth will be minimal and straight pins will be a distraction to me around the mouth, so I have left the mouth undesignated at this point! Let’s start on those eyes. Grab two small and equal amounts of your eye color. Roll each of these tufts into a small ball between your fingers. Remove the straight pin, slide the tuft of wool onto the middle of the straight pin and place it back on the chosen area of your felted project. Next begin felting the eye shape. My eye is black and circular. To felt this shape I choose a distance away from the center of the straight pin and maintain that distance as I felt circularly around the straight pin. Once the eye shape is weakly established, I remove the straight pin and needle felt the entire eye until it is even. To highlight the eye or add pupils, grab two smaller tufts of wool in the color of choice. 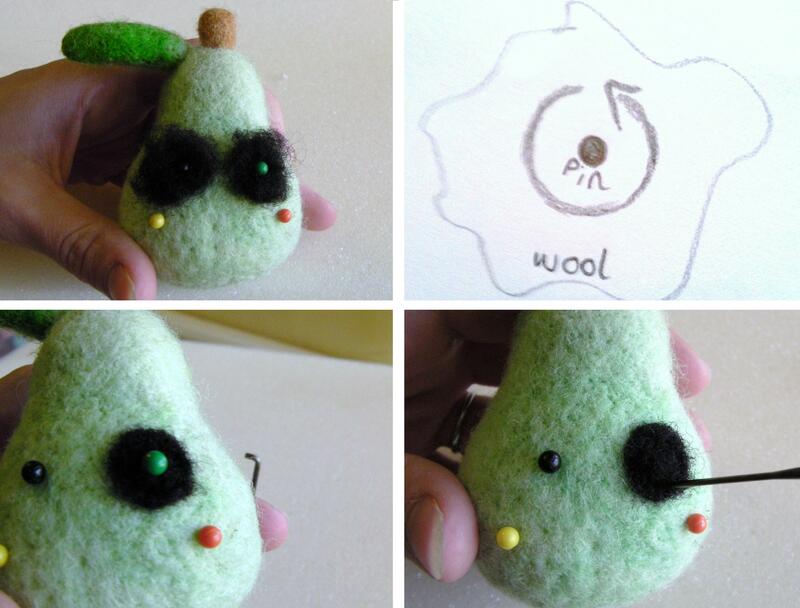 Roll the tuft into a ball and place this tufty ball onto your felting needle. Next position the tip of the needle where you are adding your highlight or pupil and go in and out in the exact same point on your project. This will focus that tiny tuft of wool into one small area. 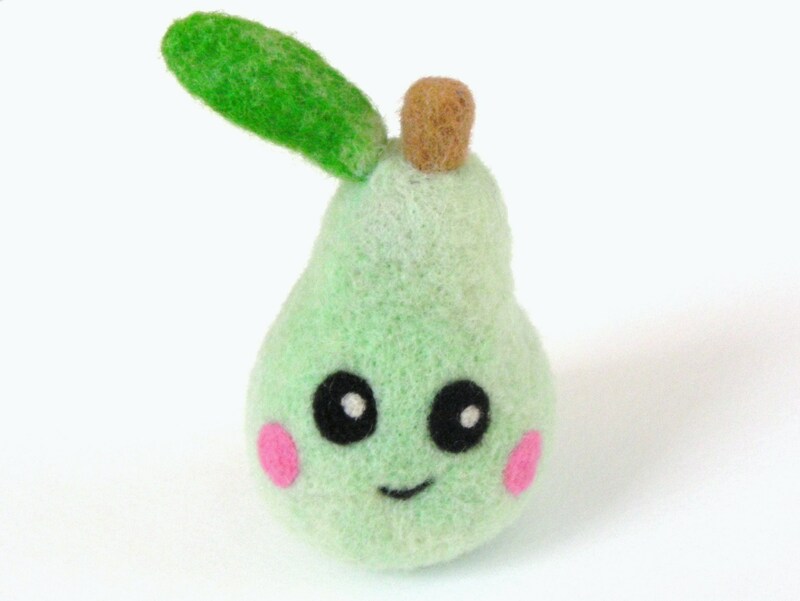 My pear just happens to be a blushing pear and therefore needs pink little cheeks. The cheeks are created the exact same way that the circular eyes were created two steps ago. Place the wool tuft with the straight pin, needle felt circularly around the pin to create the border for the cheek, remove the straight pin, and felt until even! 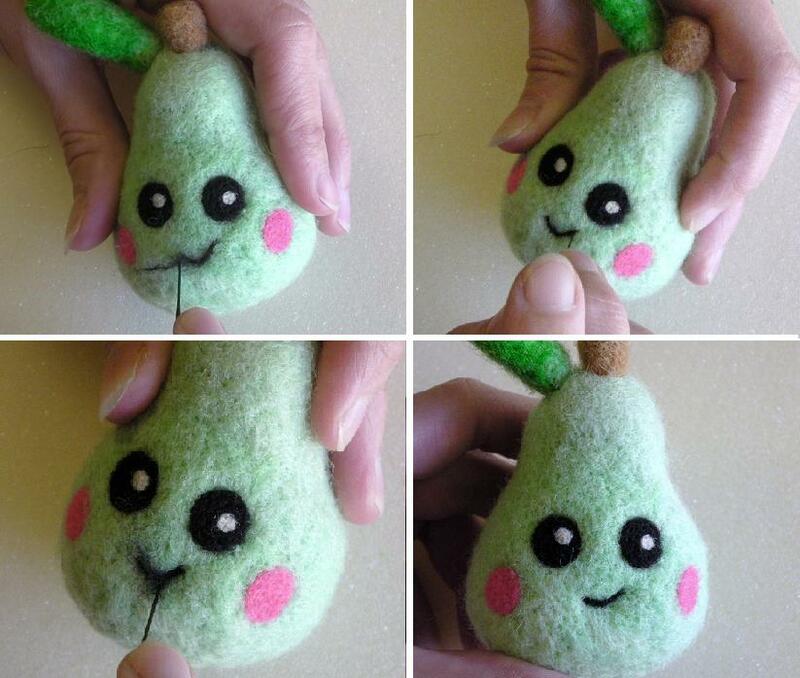 To create the smile on the pear, I grabbed a very thin piece of wool and stretched it into a thin line. I then placed one end of the wool onto the far right side of the mouth and used my felting needle to tack down the line of wool as I progressed to the left side. Afterwards, I grabbed another small tuft of wool, stretched it into a thin line and felted it over this guideline to get a smooth, finished look! My happy, blushing pear is now complete! This is a very basic face, but sometimes Less is indeed More. I will share a more complicated version of facial features in a future post. If you have any questions, please ask! Ahh, that is so cute! I’m felting a bunny at the moment! I never understood what I did wrong but it was all the basics: not densely felted base shape, not having an idea upfront of the details and having no pins to orientate my work around. You cover them all. Thank you very much! 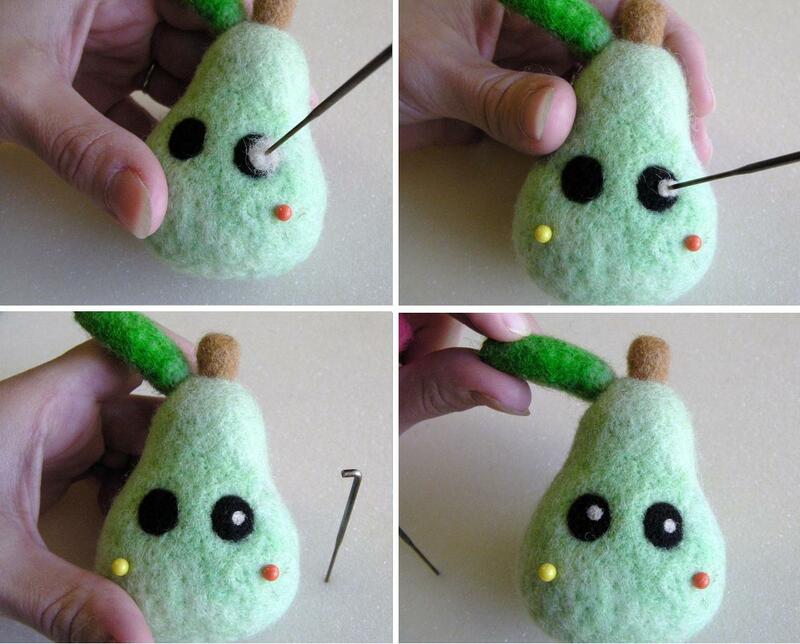 I have one question left: do you use a smaller/bigger needle for the details than for making the basic (pear) shape? Hi, I’m so glad the tutorial was helpful. I use a slightly larger needle to lightly tack down the detail work, then I switch to a smaller needle to finish it up.